It might seem like that tiny plastic straw in your soda is the least of our environmental worries. But environmental experts say that they’re doing our planet oceans of harm. McDonald’s, a worldwide contributor of plastic waste, seemed to take the threat seriously when, in January of this year, the company promised to make all of its packaging from renewable, recyclable or certified materials by 2025. However, this week McDonald’s seemed to have reneged on that pledge when shareholders at the company’s annual meeting voted against swapping plastic for eco-friendly straws. A note from McDonald’s board of directors shared with shareholders before the meeting said that the move was “unnecessary, redundant to our current practices and initiatives, and has the potential for a diversion of resources with no corresponding benefit to the company, our customers, and our shareholders, particularly in light of our ongoing packaging sustainability efforts,” reported Mercury News. The letter effectively suggested that the straw ban would somehow work against the 2025 initiative and encouraged shareholders to vote against it. And they did: The proposal only received 7.65 percent support from shareholders, reports Mic. If that strikes you as a thing of no concern, then let us explain why this decision is something you should care about. While many types of plastic can be recycled, it doesn’t degrade over time. A whopping 79 percent of our plastic trash ends up in landfills or the environment, one 2017 study found. According to the United Nations, more than 8 million tons of trash ends up in our oceans, 80 percent of which is plastic. That’s led to, among other damage, a pile of floating plastic trash in the Pacific Ocean that is three times the size of France. All types of plastics, in turn, harm marine ecosystems and wildlife. Every year, 1 million birds and 100,000 marine mammals and sea turtles die from eating plastic or becoming trapped in plastic, according to the Whale and Dolphin Conservancy. A full 59 percent of seabirds ate plastic between 1962 and 2012, found a 2015 study, with researchers estimating the rate at 90 percent if animals were retested today. At the level we’re currently dumping single-use plastics, the United Nations says, by 2050 there will be more plastic than fish (by weight) in our oceans. Straws are a bigger deal than you think. Although most people these days recognize that plastic is a problem, many of us have no idea that straws play a significant role. Americans alone throw away an estimated 500,00 plastic straws every day, according to the National Parks Service — and plastic straws can’t be recycled. “The use of plastic straws is an epidemic that only started about 10 years ago on a global scale,” says Douglas Woodring, the founder and managing director of Ocean Recovery Alliance, a nonprofit dedicated to preserving the world’s oceans. It adds up. A report by the 5 Gyres Institute, an organization dedicated to cutting plastic pollution, looked at data from the six American organizations that clean up beaches and found that plastic straws were the fifth most common beach trash picked up in the United States. A straw, the institute says, doesn’t break down, but it does oxidize and become brittle from exposure to the sun, breaking into many smaller pieces — increasing the potential number of fish, birds, turtles and other wildlife that might ingest it. What is being done about plastic straw waste? Over the past few years, consumers are becoming more aware of the plastic problem we’re facing, in part through programs like the Ocean Conservancy’s Skip the Straw campaign. “We frequently field requests from concerned citizens and even restaurant owners interested in implementing straw-free policies and are enthused by the growing movement by restaurants, communities, states and even countries around the world to skip the straw,” says Mallos. Indeed, many governments have banned waste from straws and other plastic waste. In 2016, France became the first country to ban all noncompostable plastic bags, cups and containers. This February, a bill made its way to the California legislature banning single-use plastic beverage container caps, including straws. And just this week, New York City councilman Rafael Espinal introduced legislation in partnership with the Wildlife Conservancy Society’s (WCS) Give a Sip campaign that would prevent food service establishments in New York City from offering consumers single-use plastic straws; 132 restaurants and other organizations have already voluntarily made the pledge. “A single straw may seem like nothing. It’s not. Tons of plastic enter oceans around the world each year. New York can help lead the way by saying no to plastic straws,” said John Calvelli, WCS executive vice president of public affairs, in a statement. In the meantime, several companies are producing or developing biodegradable straws. Aardvark paper straws, the 5 Gyres report found, quickly break down once they make it to the environment. Lolistraws has launched a Kickstarter campaign to create hypercompostable, edible straws made using their proprietary nontoxic marine seaweed recipe. And scientists are even working on creating a new type of PET plastic that, unlike the existing stuff, is degradable. 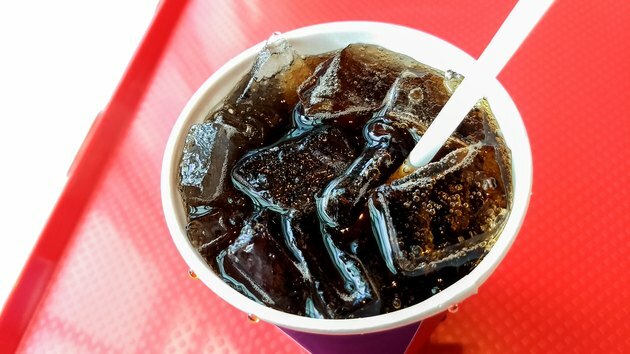 Woodring speculates that chains like McDonald’s, however, may remain opposed to a ban on plastic straws because they fear the loss of customers. Yet the chain’s participation could be a game changer. Since launching an environmental initiative with the Environmental Defense Fund 25 years ago, the company boasts that it has eliminated more than 300 million pounds of packaging and reduced waste by 30 percent in the first 10 years. What’s more, McDonald’s has already promised to get rid of all plastic straws — but only in its U.K. restaurants. Sum Of Us has launched a petition asking McDonald’s to ditch plastic straws worldwide that has garnered nearly all of its 500,000 signatures as of the end of May. Do you use plastic straws? Did you know that straws play a significant role in the world’s plastic problem? Will you sign the petition asking McDonald’s to ditch plastic straws? Let us know in the comments.